Congratulations goes to Tom Doby of Simbrah Way for earning yard of the month for August 2017. Tom has come a long way in getting his property ready for this accomplishment and if you have a chance to drop by his house , I feel quite confident that Tom wouldn’t mind giving out pointers on how he did it and answer your questions. Ayrshire Glen community would like to congratulate Margarita Cordero of Blithe Low Place for her earning yard of the month for July 2017. Miss Cordero was one of the residents that was considered for June 2017 except for a couple of points needed to accomplish this award, but without notification she took care of these issues that put her at the top of list for July. One of our neighbors on Brahman Meadows Ln is missing her cat. Millie is her name. She is gray and petite, but she is an adult. If anyone have seen her and her where about’s please contact Ed Stephens at 704-619-8550. Thank you so much for your assistance in this matter. The little children of the owner of Millie would greatly appreciate it. Congratulations goes out to our 2017 Graduates from Olympic HS and South Mecklenburg HS. These 6 students have accomplished such a great feat. Staying on track to complete and graduate high school in today’s time takes a lot of hard work and self motivation. We here in Ayrshire Glen are so proud of these young me and women and we wish them nothing but success and happiness as they take their next step in life. Central Piedmont Community College . Following in the foot steps of his late father, Thomas, Sr. The Ayrshire Glen community would like to congradulate Anabel and Carlos Colon of Blithe Low Place for earning YARD OF THE MONTH for the month of June 2017. Many properties in our neighborhood came close, but Anabel and Carlos earned the most points and brought home the gold so to speak. Please continue to keep up your properties here in Ayrshire Glen and make sure your clover have been treated and make sure your home has been pressure washed against Mold. These two items can cost you $50.00 and YARD OF THE MONTH. Today Friday 13, 2017 around 5:00 am this morning we had several vehicles vandalized. Confirmation of this thief were made on Murray Gray and Terentase which is the very first street on the right entering our community. We are in the midst of reviewing several security camera’s in our community so we can compare videos. We DO have a video of this man in action! If anyone has information concerning this theft please contact your HOA team here in Ayrshire Glen. If you may been wondering why you have seen surveying on Shopton Road lately. The survey company mentioned that the city of Charlotte is preparing to replace the bridge that is located to the right of our neighborhood as you pull out. The City of Charlotte also has plans to replace the All Way Stop at the corner of Shopton Rd and Beam Rd at the Police Academy with a Round About. Once we get more information concerning these changes, we will post time and dates. Between December to March is the mating season for coyotes with the pups being born early spring. Coyotes usually travel alone and are no threat to humans, but this time of year they travel in packs looking for a mat. If you come across these animals please stay clear because they may be protecting their mate or there new pups and can become violet. Adults are about the size of a medium-sized dog and weigh between 20 and 45 pounds. The coyote is classified as a carnivore, but it is an opportunistic feeder, meaning it will feed on a variety of food sources, depending on what is most readily available and easy to obtain. Primary foods include fruit, berries, rodents, rabbits, birds, snakes, frogs, and insects. They will scavenge on animal remains, including road-kill, as well as garbage and pet food left outdoors. 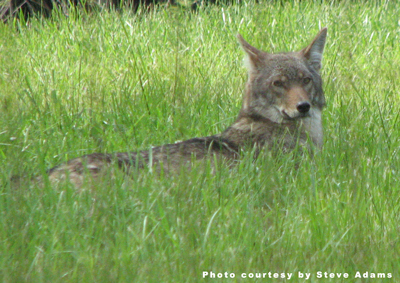 Like many wild animals, the coyote’s diet varies with seasonal changes. We recently had an incident where someone has been going through mailboxes here in our community. In one case this person had emptied the mailbox and threw the mail into the flower bed. The second case was when someone took a personal check from the outgoing mail and washed the check clear then added a different name such as WAL-MART and then changed the amount to $500.00. Our neighbor did retrieve the money, but had to go through a long process to accomplish this. It is that time of year where this type of crime happens way to much. Please be vigilant and keep an eye open for your neighbors and I feel quite confident they will do the same. If you see something suspect DON’T CONTACT THE BOARD CALL 911.